At the beginning of the nineteenth century, the last member of a branch of the Mulholland family, a schoolteacher about to die without heir, sent for his former pupil, the Belfast merchant Adam McLean. Having been instructed to dig at a certain spot in Mulholland’s garden, McLean found this bell enclosed in the magnificently ornate shrine that was made for it in Armagh around 1100. The Mulholland family had been ‘keepers of the bell’ since mediaeval times. Unlike so many of the objects featured in this book, the bell owes its power not to its finesse or opulence but to its simplicity. 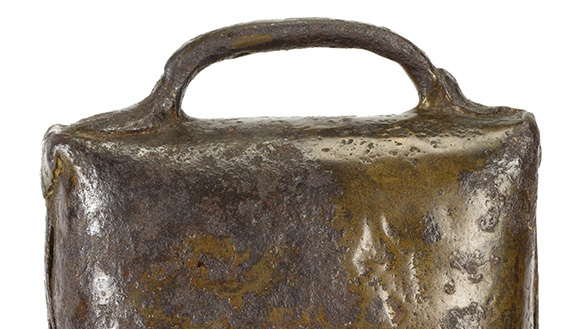 Small (less than seven inches high) and plain, it is made of two pieces of thick sheet-iron, coated in bronze, closely riveted together, with a little looped handle at the top. The tongue of the bell appears to be a later addition. It is it simplicity that made credible the belief that the bell belonged to St Patrick, even though it is probably of later origin. The Annals of Ulster, for 553, written many centuries after the event, record the opening of the tomb of St Patrick 60 years after his death and the recovery from it of his goblet, the ‘Angel’s Gospel’ and the ‘Bell of the Testament’. An angel allegedly directed St Colmcille (Columba) to send the cup to Down and the bell to Armagh, and to keep the Gospel himself. The bell was certainly an object of great veneration in the Middle Ages, and was woven into the legends of Patrick’s miraculous deeds. (He was said to have rung a bell at the conclusion of his apocalyptic battle against the forces of evil, disguised as birds, on Croagh Patrick.) Aside from its religious and legendary power, though, the bell had great political significance. Along with the Book of Armagh and the ‘staff of Jesus’ (destroyed in Dublin in the sixteenth century), the bell was crucial to Armagh’s claim to be the centre of Patrick’s legacy, and thus the superior seat of Irish Christianity. The church was a new source of power and prestige in Ireland, and claims to primacy in church affairs were never going to be uncontested. As Patrick began to be accepted as the sole father of Irish Christianity, it was important to be able to prove a direct connection to his authority. Armagh, Downpatrick and Saul all claimed to be the site of his burial. Other centres disputed Armagh’s primacy—the early partisan of Armagh’s claims, Tírechán, complains of those who ‘hate Patrick’s territorial jurisdiction’ and attack Armagh’s status. Thus, however touching it may be as a plain expression of simple piety, the bell was also a mighty weapon in a struggle for power. From the earliest days, the spiritual message of the new religion could not be entirely disentangled from old-fashioned political struggles for pre-eminence.